Memory Protection Devices (MPD) is the global leader in AAAA battery holders, with over 30 years of unparalleled design and manufacturing experience, offering top quality products to virtually all leading electronics manufacturers. MPD manufactures four different types of standard AAAA battery holders. For applications requiring a single AAAA-cell, we offer the BE-AAAA-PC, which offers an extremely low profile, standing just 8.50 mm above the PCB. 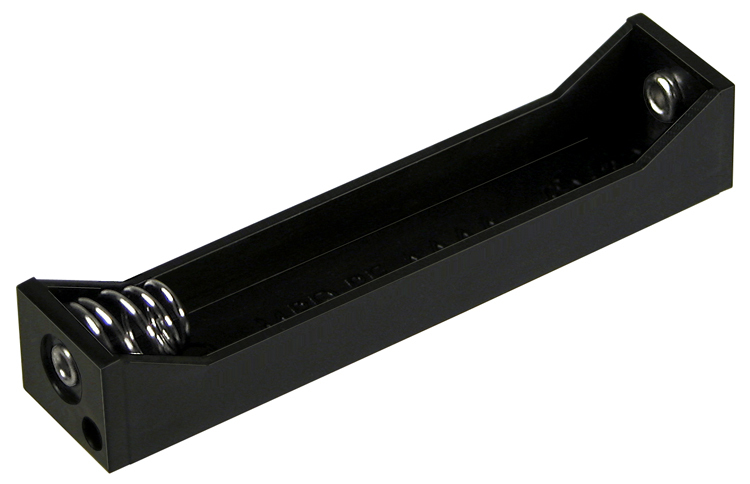 This high quality battery holder is manufactured from black ABS with nickel-plated steel spring contacts and PC pins. The BE-AAAA-W is identical to the BE-AAAA-PC in all aspects, except it has wire leads instead of PC pins. If you are looking for a battery holder that accepts two (2) AAAA-cells, then the BE-2AAAA-PC provides the perfect solution. The BE-2AAAA-PC is made from black ABS, with nickel-plated steel spring contacts and PC pins, and stands just 8.5mm above the PCB. The BE-2AAAA-W is identical to the BE-2AAAAPC, except it has wire leads instead of PC pins. Looking for the best quality and the best price on holders for AAAA batteries? Then look no further than MPD.